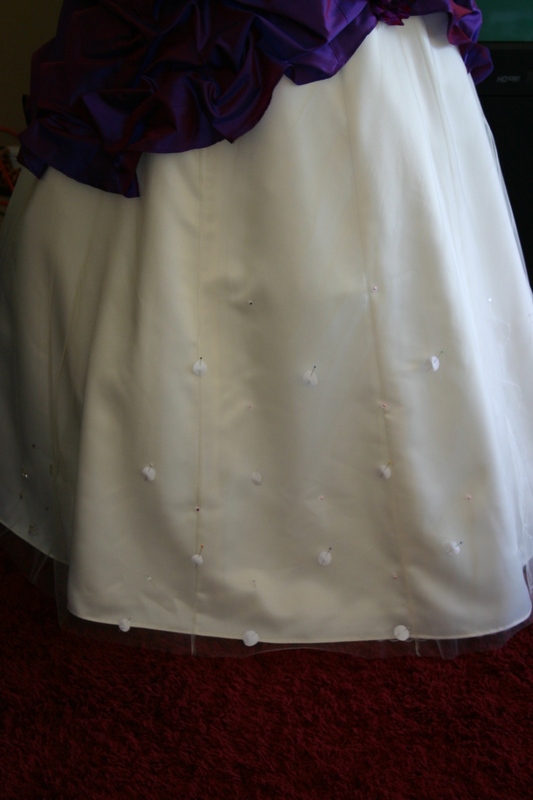 After Rachel’s fabric fitting, I worked on embellishing the skirt. 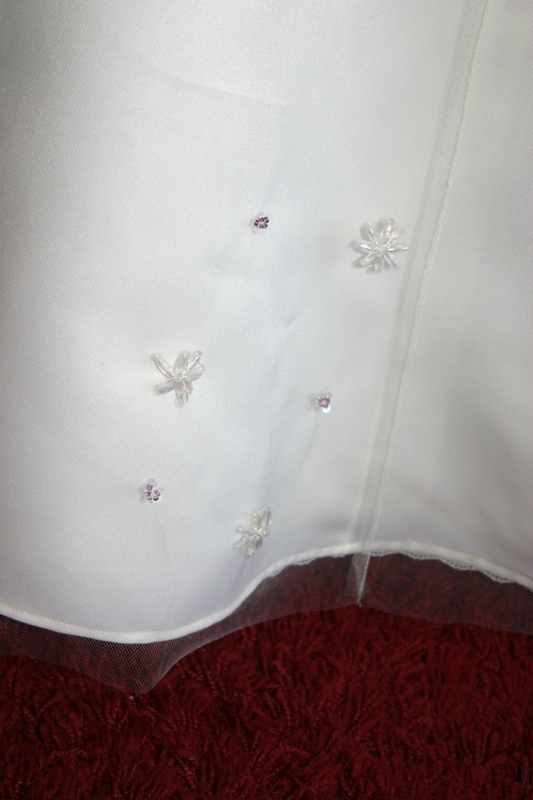 Our original design plan had been to dot the skirt with small purple fabric flowers, and adding a sprinkling of beads and sequins around them for some extra sparkle. It sounded good, it worked in the sketch, it had been gorgeous in a couple of inspiration photos we drew from. In real life, on her gown, it was all wrong. The contrast between the deep purple and pale ivory was too stark, and the small flowers made the skirt looked almost polka dotted. Adding that to the mixed textures and silk pick ups that we were already using, and the skirt was far too busy. I sent Rachel pictures of the gown with the flowers pinned in place, and she replied first asking me to thin them out, and then asking if we could rethink them altogether. Rachel apologized but I let her know – this is part of the custom process, and it’s precisely the reason why I send progress photos! Sometimes what sounds good in theory turns out a bit different in practice. It was time to rethink things. Over the course of a couple of days we emailed back and forth. 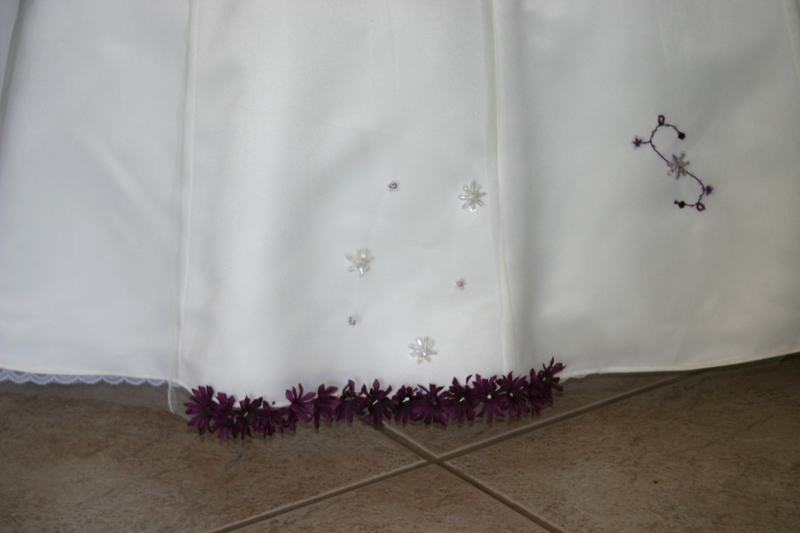 I sent photos of a number of possible alternatives, adding flowers at the hem instead of dotting throughout, beading small sections of the skirt with purple beads, clear beads, small ones and large ones, sections matching the beading on the bodice, random scatterings and little flower shaped bead clusters, long trailing “vines” of ivory thread and clear sequins. I tried to do just enough of each sample to let her see, without devoting too much time to any of them and without overhandling the fabrics. 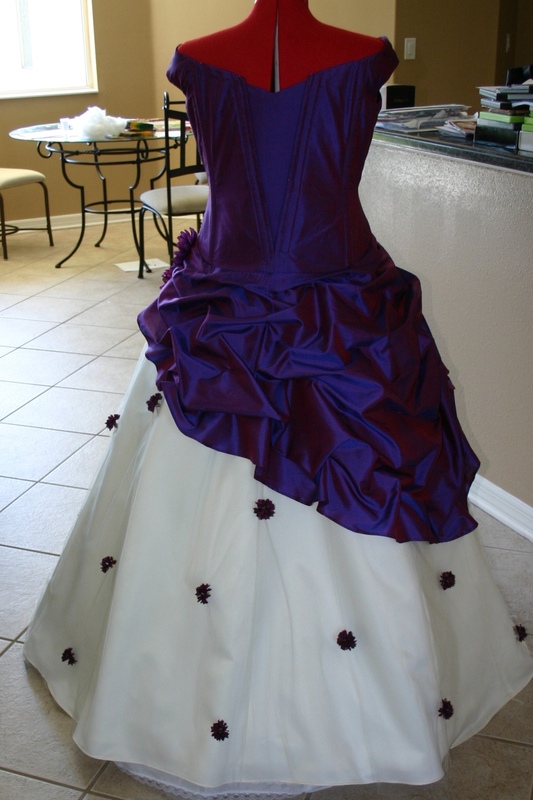 Ultimately, Rachel decided she didn’t want purple beads or purple thread in the skirt; the contrast was just too much. She liked the look of the ivory “vines” with sequins, and asked if I could do this but also scatter in a few of the beaded flowers (in clear beads) for a bit of texture. I can’t begin to tell you how glad I am that she wanted to change plans; the end result is so much better than what we’d designed at first, such a better fit for Rachel and for her wedding.